First North Western was a train operating company in England owned by FirstGroup, that operated the North West Regional Railways franchise from March 1997 until December 2004. In the lead up to the privatisation of British Rail, the North Western section of Regional Railways was established. For a brief period from 1989, this section was operated under the short-lived Network NorthWest brand name, before becoming North West Regional Railways. 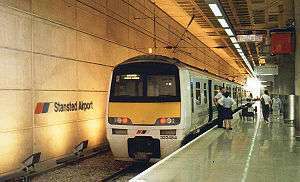 The franchise was awarded by the Director of Passenger Rail Franchising to Great Western Holdings , with operations commencing on 2 March 1997 under the North West Trains brand. On 27 October 1997, a new livery of dark blue with a gold star was unveiled. In March 1998, First bought out the other shareholders in Great Western Holdings. The business was rebranded from North Western Trains to First North Western in November 1998 with First’s corporate blue, pink and white livery adopted. First North Western operated a mix of urban and rural passenger services in North West England and North Wales, radiating out from Manchester to Birmingham, Chester, Holyhead, Liverpool, Blackpool North, Windermere and Sheffield. In May 1998, North Western Trains commenced services from Manchester Airport and Rochdale to London Euston. The Manchester Airport service ceased in May 1999. and the Rochdale service in May 2000. From May 2003, services from Manchester ceased operating south of Stoke-on-Trent and Crewe. First North Western inherited a fleet of Mark 2 carriages, Class 101, 142, 150, 156 and 158 diesel multiple units, and Class 309 and 323 electric multiple units. To operate the Manchester Airport to London Euston services, Class 322s were hired from West Anglia Great Northern. First North Western ordered 11 two-carriage and 16 three-carriage Class 175 Coradias to replace the Mark 2 carriages, Class 101s and Class 309s. Originally some were to be 125 mph capable Class 180 Adelantes but this was later changed to an all Class 175 fleet. Problems with the Class 175s saw locomotive hauled trains reinstated on North Wales services from June 2002, with English Welsh & Scottish Class 47s and First Great Western Mark 2 carriages. In February 2004, Class 31s were hired from Fragonset to top and tail Mark 2 carriages on Blackpool to Chester services. First North Western's diesel fleet was maintained at Newton Heath Depot, and the electric fleet at Lonsight Depot. The Class 175s were maintained at a purpose built depot in Chester. In 2000, the Strategic Rail Authority announced that it planned to create a new TransPennine Express franchise transferring First North Western's Barrow-in-Furness and Windermere services, with the North Wales Coast Line services transferred to a new Wales & Borders franchise and the remaining services combined those of Arriva Trains Northern to form a new Northern Rail franchise. On 28 September 2003, the North Wales Coast Line services transferred to Wales & Borders. In July 2003, the Strategic Rail Authority awarded the TransPennine franchise to FirstGroup/Keolis with services operated by First North Western transferring to First TransPennine Express on 1 February 2004. In July 2004, the Strategic Rail Authority awarded the Northern franchise to Serco-Abellio with the remaining services operated by First North Western transferring to Northern Rail on 12 December 2004. ↑ "Summary of Events: 1986 to 2002". Museum of Transport Greater Manchester. Archived from the original on 11 November 2011. Retrieved 30 June 2014. ↑ "Network Northwest". Rail. EMAP (93): 39. 6 April 1989. ISSN 0953-4563.